He joined teammates in locking arms during the 'Star Spangled Banner' on Sunday while other players kneeled. BOSTON — When the time came for the national anthem Sunday, one of the biggest questions of the day concerned New England Patriots quarterback Tom Brady. 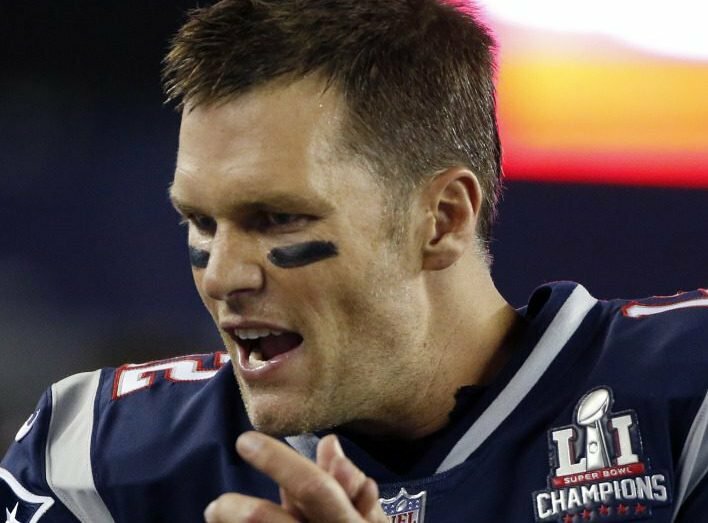 Would Brady, who stood by his friendship with Donald Trump throughout the presidential campaign with maddeningly vague answers, take a knee in solidarity with his teammates after Trump called for NFL players who protest social injustice and racial inequality to be fired or suspended? Would he stand and lock arms with them? And, as the NFL’s leading player right now, would he actually say anything? He gave a hint Sunday, liking an Instagram photo posted by Aaron Rodgers of himself and three Packers players kneeling. On Monday morning, after standing for the anthem and linking arms with a teammate, Brady was more explicit. He went on to tweet that theme Sunday, saying fans should boycott the games until owners fire or suspend the protesting players. That set off protests around the league, with more than 250 players either linking arms and standing, taking a knee or, in the case of three teams, choosing to remain in the locker room for the anthem. Brady, who skipped the Patriots’ trip to Trump’s White House to celebrate their Super Bowl LI victory, stood with his teammates during the anthem and said he heard the boos in Gillette Stadium for those players who took a knee. Brady’s comment Monday echoed owner Robert Kraft, a longtime friend of Trump’s as well.